The Pew Forum on Religion & Public Life released a report this week on the size and distribution of the world’s Christian population entitled, Global Christianity. For religion researchers there is not much that is new or surprising in this report. Similar estimates are widely available and used in the field (e.g., ARDA, World Christian Database, World Values Survey, regional barometer surveys, and even the CIA World Factbook). But for the media and the public this report provides a well-done, fresh look at how Christianity has changed in the last century. Have Christians migrated in mass from Europe? 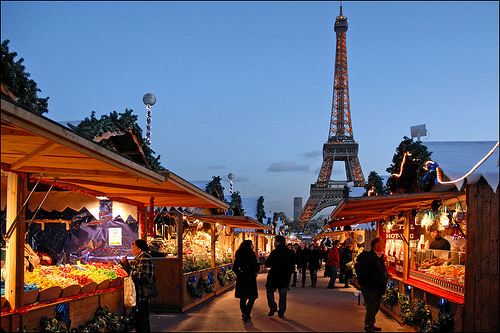 Are there fewer Christians in Europe? No to both. There are more Christians (and Catholics) in Europe now than there have ever been at any time in history. There are growing numbers of individuals without a religious affiliation (i.e., the Nones) and globalization has brought many non-Christians to the continent from other areas of the world. This has altered the percentage of Europeans who identify themselves as a Christian. But population is not a zero-sum game! A smaller population percentage does not equate a smaller number of that population when the overall population is growing. 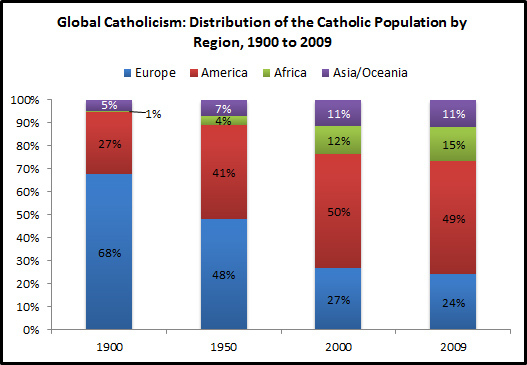 Vatican statistics have long documented the global shift among Catholics that is noted in the report. 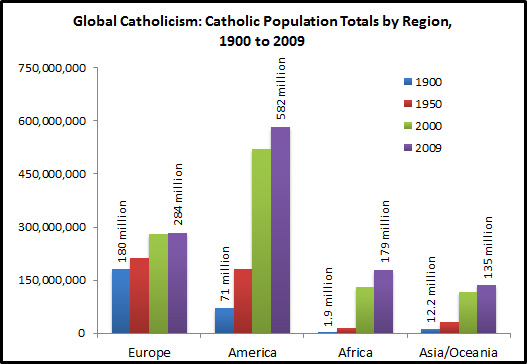 For example, below is a figure including Vatican estimates for the global proportions of Catholics by region. In 1900, 68% of the world’s Catholics resided in Europe. In 2009 (most recent data available), this had fallen to just 24%. Crisis? Not quite. The pie has gotten much bigger. There are more Catholics in the world and Europe’s slice makes up a smaller share of the whole pie but it’s still a heck of a lot bigger piece than it was in 1900. The figure below shows the total population numbers by region. Europe’s Catholic population has grown by 57% since 1900 from 180 million to 284 million today. There has been no decline in the number of Catholic Europeans. Mass attendance has certainly declined (more in some European countries than others) but the total population affiliated with the faith has continued to grow on the continent. There was also no great “migration” as the Daily Mail suggests. Africa and Asia do not have more Christians because they moved from Europe. Evangelization has clearly been important but so has another factor that is not mentioned prominently in the study or the news reports about it—fertility. In many European countries the fertility rate dropped below what is needed for growth (2.1 or above) in the last century. Immigration has filled the gap somewhat—often bringing non-Christians to Europe. At the same time, in many areas of Africa, Latin America, and Asia, population growth has quickened with declines in infant and maternal mortality rates. As a simple example think of two women: one lives in a country with a fertility rate of 2 and the other lives in a country with a fertility rate of 5. Then assume they live out these fertility rates as do their offspring. The first woman will eventually have 8 great grandchildren. The second woman will have 125 (and 625 great great grandchildren). That is the difference between a low fertility and high fertility nation/region. The growth in the proportion of Christians in what Pew calls the Global South (and smaller proportions in Europe) is largely a function of effective Christian evangelization and differences in fertility rates (sprinkled with a bit of globalization and secularization). In the figure below (World Bank data via Google Public Data Explorer), you can see the differences in fertility rates over time around the world. Just hit the arrow button to play out the changes that have occurred in the last 50 years. Note, fertility rates have dropped around the globe but the key is the number and regional distribution of countries falling below 2.0 on the y-axis. You'll find most of Europe in this part of the graph. How to explain the regional differences in fertility? Strangely enough a lot of it is economics. You can see the same fertility trends (this rate is on the y-axis) play out in the figure below with the addition of GDP per capita on the x-axis and the size of the bubbles representing total population (pause the player and place your cursor over a bubble to identify country). Although countries like China and India have the largest populations (including sizable numbers of Catholics), for the future keep an eye on the number of Christians in Nigeria which is expected to grow substantially in the 21st century (currently the home to 20 million Catholics and nearly 60 million Protestants). Above photo courtesy of dalbera at Flickr Creative Commons. You’ve spent the last four weeks singing “O Come O Come Emmanuel” and getting used to the new Missal translation. You’ve watched the Advent candles be lit, celebrated the beginning of the new liturgical year, and readied yourself in “joyful anticipation” for Christmas. Maybe you’ve headed to a Christmas concert (or two), maybe you’ve had family pictures taken (awkward or otherwise). 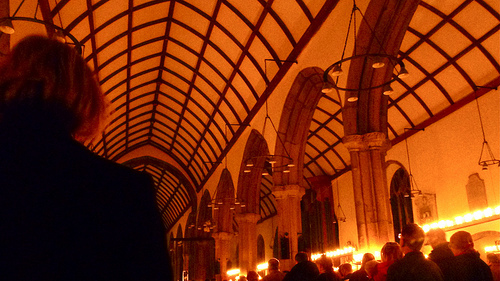 And then the big day (or Midnight Mass) comes–and there is a stranger sitting in your pew! Yes, it’s the most wonderful time of the year–and with it come back our brothers and sisters we affectionately call “C and E” Catholics (Christmas and Easter). Who are these people who flock to our pews two times a year? And, how many people are we talking about fit into this camp? Actually, just over half of self-identified adult Catholics attend Mass once or twice a year or less often (data source: CARA’s Sacraments Today). These are the guys (...more often men than women) in green below (56%). Forty-four percent of self-identified Catholics, those in red below, attend Mass more frequently. These “C and E” Catholics are young and have some of the traits we associate with this demographic. They are less likely to be living in a home they have bought and less likely to be married. Expect a more youthful look around your parish Sunday with more than six in ten Catholics born after 1960 fitting into the “C and E” Catholic mold. They also have differing opinions on the meaningfulness of the Sacraments. 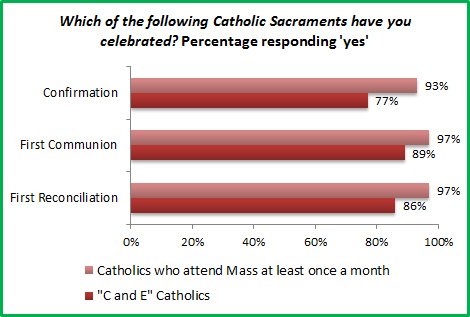 They are less likely than regular Mass attenders to say that each of the Sacraments is “very meaningful” to them. 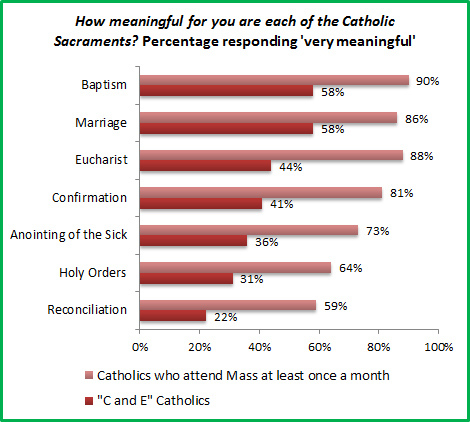 In fact, regular Mass attenders are twice as likely as the “C and Es” to say that most of the Sacraments are “very meaningful” to them. When asked to select which of the Sacraments that is the most meaningful to them, regular Mass attenders most often selected the Eucharist (43%), compared to less frequent attenders, who selected baptism most often (42%). So-called “C and Es” are also less likely than more regular Mass attenders to believe in the Real Presence in the Eucharist (40% to 79%, respectively). These differences in meaningfulness of the Sacraments may be rooted in a lack of early engagement. Those who attend Mass less frequently are slightly less likely (but still statistically significantly) than those who more regularly attend Mass to have fulfilled their early Sacramental rites, including First Communion and Confirmation. And, not to judge, but what do the data say about why these people may be in my pew just once or twice a year? Why have they missed Mass? 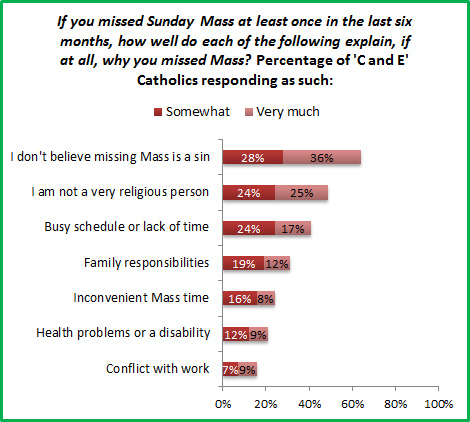 Turns out, it is a combination of not thinking missing Mass is a sin and not being very religious. My advice to you is the same advice I give my children when they are frustrated: take a deep breath, smile, and remember that God loves you and all of creation. There may be less room in the pew but that makes it an even merrier Christmas! Above photo courtesy of HerryLawford at Flickr Creative Commons. Linked concert vocals by Margaret Cidade-Harkleroad and the Saint Francis International School Choir. When I was a kid, just beginning to learn about the Catholic faith, I thought making the sign of the cross before prayer was how you "dialed God's phone number." 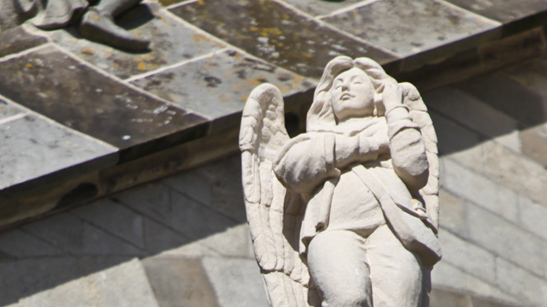 The statue in the image above, an angel with a cell phone to her ear, is from St. John's Cathedral in the Netherlands and is quite a literal translation of the idea of "calling God." These days many are concerned that young adult Catholics have "lost" God's phone number or are just no longer interested in talking. It is the case that the most common time for someone raised in the faith to leave it, is in the teens and early 20s. At the same time it is also the case that Catholicism keeps more of its young faithful in the United States than any major Protestant denomination. The rise of the Nones—those without a religious affiliation—is almost a mirror image of the decline in young adult Americans affiliating with some other Christian denomination (source: General Social Survey). As the figure below shows, in 1972, 58% of those age 18 to 35 in the United States self-identified their religion with a Christian faith other than Catholicism (mostly Protestant denominations). In 2010, this had fallen 16 percentage points to 42%. During this same period the percentage of people in this age group lacking a religious affiliation rose from 9% to 26% (+17 percentage points). 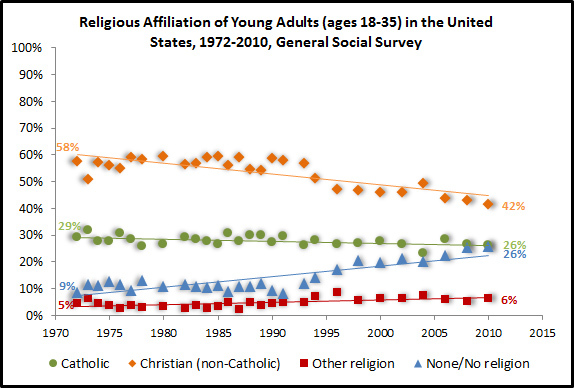 Catholic affiliation among U.S. young adults has remained much more stable dropping 3 percentage points from 29% in 1972 to 26% in 2010 (this difference is within margin of error). The percentage of young adults affiliating with some other non-Christian religion has also remained stable. 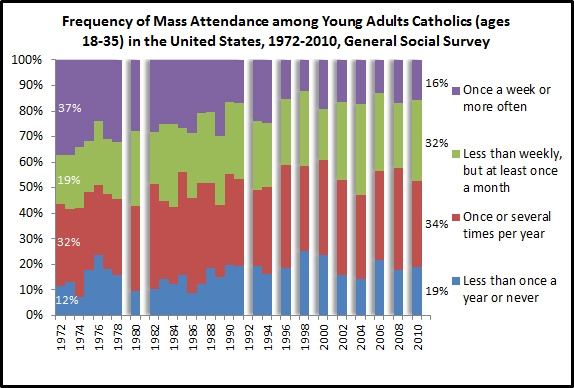 Although the affiliation numbers are reassuring the estimates for the Mass attendance of young adults is far less positive. Catholics between the ages of 18 and 35 attend less frequently than older and younger Catholics (who are brought to church by their parents). Currently only about 16% of Catholics between the ages of 18 and 35 attend Mass every week. 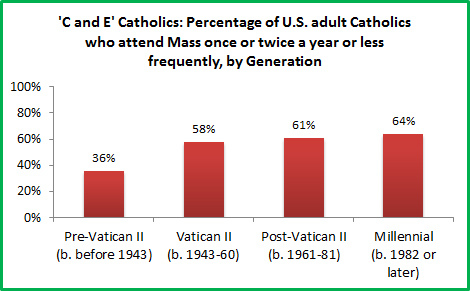 By comparison 37% of Catholic young adults attended every week in 1972 (a decline of 21 percentage points). As the percentage of weekly Mass attenders has grown smaller, the share of Catholic young adults saying they attend Mass less than weekly but at least once a month has increased from 19% in 1972 to 32% in 2010 (an increase of 13 percentage points). Those saying they attend only a few times a year, less than annually, or never have remained more stable over time. If there is any silver lining in these data it is the fact that many young adults have not fallen completely away from their faith and still have some consistent connection to parish life. The difference in the data between affiliation/identity and the practice of the faith is still remarkable. Of course so much of the Catholic faith is in action; in doing things rather than just believing them. Going to Mass and celebrating the Eucharist are essential. Is there any evidence that young adult Catholics are still calling God in some other way? 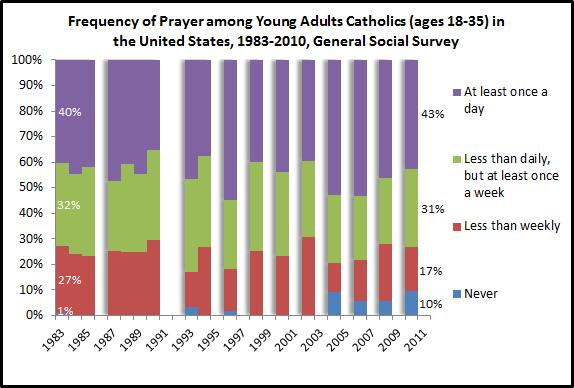 The figure below shows changes in frequency of prayer among young adult Catholics. Consistently about four in ten have reported daily prayer during the last three decades in which this question has been asked in the GSS. Also solidly consistent is the number indicating prayer at least once a week. Most young adults Catholics, about three in four in all, are having at least one conversation with God every week. They just aren't doing it in a brick and mortar parish. It is as if more recent cohorts of young adults have come to think of the parish as the "land line" connection to God—one they don't need as much or anymore given their personal connection to God through individual prayer. Perhaps the biggest challenge for the 21st century Catholic parish is to make the case for community and celebration within its walls for young adults who more often shun real world gatherings and tangible memberships for virtual content and connections (and they apparently are not doing much related to their faith online either 1, 2). So it's not that young adult Catholics have hung up the phone and ended the conversation. The affiliation and prayer data are quite reassuring. Even the Mass attendance data shows that nearly half are in a parish at least once a month. The bigger questions are about how the Church can convince young adults to be there more often and how it can make the case to them to take their more regular personal prayer connection to God and share this with others as a parish community.